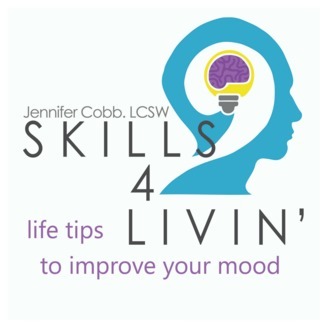 Join Jennifer Cobb as she uses Dialectical Behavior Therapy (DBT) skills and other evidence-based research to sort through all of the confusing research about health, emotional wellness, and living your best life and gives you the tools to take action. The guest on today's show is Jennifer Owens, the co-founder and Wellness Director of Bridge Counselling and Wellness, in Louisville, Kentucky. Bridge Counselling and Wellness is an Integrative Health Centre that provides individual therapy, yoga, fitness, cooking classes, meditation and workshops. Jennifer is an Integrative Mental Health Therapist, a licensed Clinical Social Worker and a Certified Personal Trainer and she specialises in the holistic treatment of anxiety. Jennifer (Cobb) came across Jennifer's website and she became fascinated with all the different modalities that they use to promote wellness- all with the recognition of the interconnectedness of our mood and our bodies. They provide individual sessions in conjunction with other classes, to help people to restore balance and wellness within themselves. Today, Jennifer, who really understands the connection between our bodies and our brains, talks about how you can view your physical and mental health in an interconnected way, as a whole package. 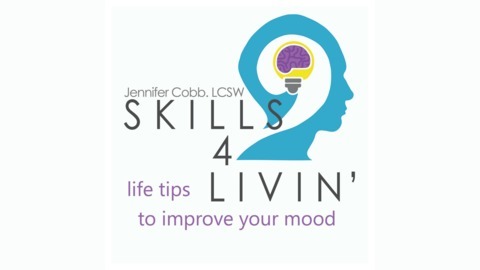 She breaks it down in a way that's easy to use, so that you can walk away from today's show with some detailed and clear tips about how you can make small changes in your life that could have a big impact on your mood. Listen in and find out more about how you can change your diet, to restore balance in your life. How she initially became interested in the food/mood connection. How she worked with her own anxiety. Her cooking classes- what they're about and why she and her team began to develop them. That the overwhelming amount of information available today impedes people's ability to make smart choices. The links of diet to mental or emotional problems. That Jennifer and her team of practitioners know that they need to use multiple interventions in different combinations so that people can find what's best for them. The Seven Key Areas that Jennifer focuses on for the food/mood connection: 1) Nutrient Deficiencies 2)The effects of sugar on mood 3) Gut Health 4) The role of inflammation 5) Essential Fatty Acids 6)Water and staying hydrated 7) How your mood affects your food choices. The link between depression and nutrient deficiencies and how the different vitamins actually help. That thyroid issues can also be linked to depression. Foods that Jennifer recommends- mainly leafy greens. The importance of reducing processed, refined and fried foods in your diet. Why you should avoid sugar in your diet. The hidden sugar in processed foods. That about 95% of your bodies store of serotonin is produced in your gastrointestinal tract. Explains more about gut feelings. The probiotic function of the bacteria in your gut and how it can affect your mental health. How to manage your gut health. Inflammation in the brain can be an indicator of depression, or even schizophrenia and that inflammation is the precursor to any disease in the body. The benefits of following an anti-inflammatory diet. The big culprits for causing inflammation. Two great anti-inflammatory foods- turmeric and omega3 fatty acids. The great health benefits of turmeric and saffron. Which foods contain Omega3 Fatty Acids and why you really need to supplement them in your diet. How Omega 3's enhance the effect of ADHD medication. That the effects of mild dehydration exacerbate anxiety. Knowing that what you're eating affects your mood is a great motivator for people to change their diet. The value of using a food/mood journal. Boil for 10 minutes, then add some lemon and some honey, if a bit of sweetness is desired.